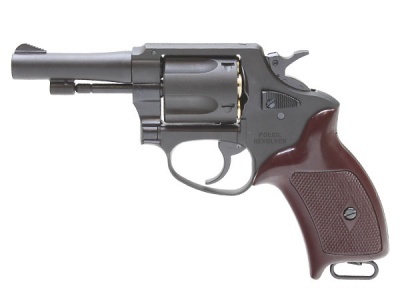 is a double-action revolver chambered in .38 Special based upon Smith & Wesson-style designs. It was designed and produced by Shin-Chuō Industries, later merged with Minebea. "New Nambu" was named after Kijirō Nambu, a notable firearm designer and the founder of the predecessor of Shin-Chuō Industries. Approximately 133,400 have been produced since 1961. The production was completed in the 1990s, but it is still one of the standard firearms carried by law enforcement officials in Japan. In the pre-war era, most Japanese law enforcement officials had only a sabre. During the Occupation, the Supreme Commander for the Allied Powers suggested them to be equipped with firearms. Because of the insufficient stocks of the domestic handguns, Japanese police started to receive service firearms leased from the Allies from 1949, and by 1951, all officers were issued handguns. At the beginning, types of sidearm varied, but M1911 pistols and M1917 revolvers, Smith & Wesson Military & Police and Colt Official Police were used as the main sidearm. The .38 caliber revolvers were well-received, but .45 caliber handguns were too large to carry for somewhat small officers especially women. And especially M1917 revolvers were obsolete, deteriorated significantly, so malfunction or reduced accuracy had been a problem. As a response to these issues, the National Rural Police Headquarters (one of the predecessors of the National Police Agency) and some Municipal Police Departments (predecessors of Prefectural Police Departments) started to import small .38 Special caliber revolvers such as Smith & Wesson Chiefs Special and Colt Detective Special. But there were many handguns to be replaced, and with the policy of protecting industrial growth, the Ministry of International Trade and Industry (MITI) had been oriented to domestic production of service firearms. In 1957, the development was started by Shin-Chuō Industries under the leadership of the MITI. The development of three handguns had been promoted at the same time in parallel: .32 ACP caliber semi-automatic pistols, 9×19mm Parabellum caliber semi-automatic pistols, and .38 Special caliber revolvers. Semi-automatic pistols were completed as New Nambu M57, but both of them did not enter into mass production. On the other hand, the revolver, completed as New Nambu M60, was satisfactory for the National Police Agency, and mass production was started in 1960. Basic design was based on those of the "J-Frame" and "K-Frame" revolvers of Smith & Wesson company. The revolver has a five-round cylinder, but does not fit a "J-Frame" speedloader because the actual cylinder is slightly larger. The weapon`s barrel has 5 grooves, with a right hand twist and 1 turn in 15 inches. Barrel lengths vary from 2 to 3 inches. The trigger mechanism is double-action/single-action. The Minebea M60`s accuracy is excellent in single-action shooting, capable of groupings of 50-millimetre (2.0 in) at 25 metres (27 yd). A sport-use intended variant equipped with weighted longer barrel, adjustable rear sight, and adjustable competition grip called the New Nambu M60 Sakura was considered for production, but the product never went past its prototype phase. Only three prototypes were exported for Europe.